Read part 1 of "Eighty-three" Read part 2 of "Eighty-three" Read part 3 of "Eighty-three" Read part 4 of "Eighty-three" Read part 5 of "Eighty-three" As with most drum corps, the Garfield Cadets' leadership team began conceptualizing which direction to go in the upcoming season during the fall and winter of 1982. Although they didn't realize it at the time, the staff's creative forces create a show that was beyond memorable, and that would change forever the way drum corps shows are designed. (The Cadets brought back "Rocky Point Holiday" in 2003 (MP3). The Garfield Cadets. Taken from the 1983 DCI program book. Johnny Sanchez: We knew we were on to something special back in 1982. There was a buzz about that show and we really began to change the activity during that season. The 1983 show was the maturation of that idea. The following years (1984, 1985) would far surpass what we accomplished in 1983, but that season really turned the activity on its ear. ^Al Chez: In 1983 the return members had a better feel for Zinagli's drill, and confidence in the entire staff. There was a much different feeling starting the 1983 season. (We had) lots of returnees from 1982; A better feel of George Zingali's and Mark Sylvester's style, and a confidence of knowing what it takes. George Hopkins: 1983 was when we stepped off the ledge. We were young -- Michael Cesario and Jim Prime drove a good deal of the thought process. Zingali, Jimmer (Jim Prime) Cesario -- they made the calls; the rest of us hung on for dear life. Eric Sabach: Zingali, Prime and Michael Cesario were the creative genius behind those shows. (Zingali and Prime) were roommates that lived across the hall from each other and when George had an idea, he would wake Jimmer up in the middle of the night to make sure the horns were in the right place. Cesario would always tell George, "I've seen that before, can't we do anything different than that?" full well knowing that he had just seen something great on paper, but wanted George to exhaust his genius, his art, his soul, into the program. Everybody pushed everybody that summer. I was lucky enough to be around that house helping George and Marc Sylvester chart that show, while I was still marching. I learned so much about the craft that way. So many Cadet age-outs have gone on to other corps as technicians, designers and even directors. Jim Prime: The possibility of programming a piece like "Rocky Point Holiday" really seemed to excite Cesario and Hopkins. Zingali's first outward reaction was that it was "too crazy" to do something with that degree of complexity and tempo. Perhaps this reaction actually convinced us that we could be on to something. I think Michael Cesario sensed that here we had something that even "outcrazied" the "crazy artist." Patrick Zampetti: George Hopkins was the glue that held it all together. He was a very young director but he was still able to get the members of the corps to focus on self-improvement without being distracted by the performance of the judging community or the other competing corps. George Hopkins: (Musically) it was a matter of piecing tunes together. We decided to keep "Rocky Point Holiday," a success by any standard. 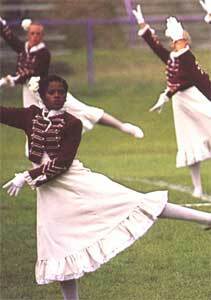 This was at a time when corps kept a good portion of their show from year to year. And then we added selections from "Mass" (Leonard Bernstein) to that starting point. I remember watching a video of the "Mass" over and over and over! We did what we did and what we liked. We were trying to carve a niche, and perhaps do well.